It wouldn't be such a jolly holiday without cookies, and RubySnap's got 'em! The holidays are hectic for everyone, so if you want to check one item off your to-do list, consider buying the treats for your party at RubySnap. 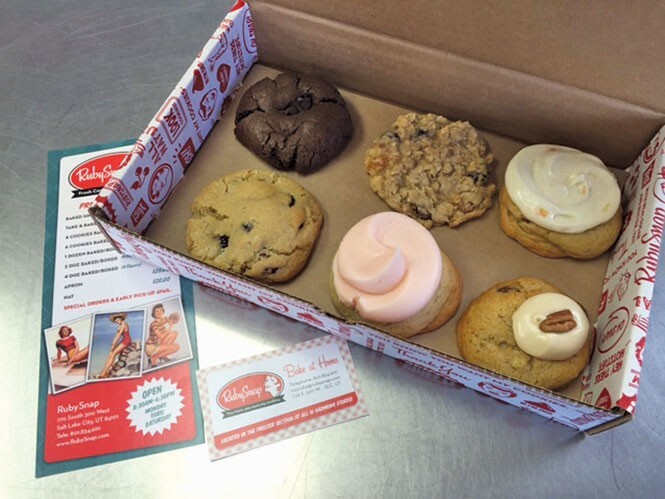 RubySnap makes some of the best cookies in the valley from all-natural, premium ingredients—bound to impress family, friends and co-workers. With flavors like the Audrey (almond dough with dried cranberries and white chocolate), the Frida (a spicy chocolate cookie with a chile de arbol ganache center), the Lola (a lemon cookie made with curd and bitters) or the Maris (a chocolate chocolate-chip cookie with a gooey caramel center), RubySnap has something for everyone to drool over. "I love the Mia [a vanilla-bean sugar cookie with butter cream beet frosting]," says Salt Lake City resident Hailey Woodside. "But I've never had a bad cookie at RubySnap." Its cookies start at $2.50 per cookie, but goes down the more cookies you order. Order a dozen cookies for $23—a savings of 24 percent per cookie. Those who can't decide on a flavor should pop into RubySnap's store where the employees, who are just as sweet as the cookies, will offer a sample or two. "I love the people I work with and the people who come in," says employee Michelle Brockman. "I've never had a customer who is angry or upset. There's something about getting cookies ... about the tone of RubySnap. We just have the nicest customers." Brockman, who says her dream job other than RubySnap would have been delivering flowers, has worked there for seven months. "Selling cookies is even better," she says. "You're delivering sugar and fat in a beautiful presentation." Need something to sip while you snack on your sugary treat? RubySnap offers fine coffees from Publik, Bali Kopi and Crio Bru (cocoa beans brewed like tea) and hot chocolate ($2.50 per cup). Jazz up your drink with add-ins like cardamom, ginger or agave alongside milk and cream. Those who want the decadence of RubySnap—and who enjoy baking at home—can purchase RubySnap cookie dough at its flagship store or in the frozen-food aisle of Harmons and Whole Foods. A bag of frozen cookie dough retails at $7.99. RubySnap also features a flavor-of-the-month and a secret menu at its flagship location, so pop in on occasion and see what's new.